Claremont Lincoln’s commitment to students is the foundation of the university, and student well-being is central to our mission. We are responsive to student needs and offer programs that are affordable, flexible, and applicable to a wide scope of market demands with societal benefits. Student concerns are addressed with intent and purpose to continually improve on student experiences and outcomes. We develop forward-looking academic programs with a keen eye on student successes, both in our academic programs and in society. Our degree programs are designed to prepare graduates to take an active role in the public domain – whether they are enhancing an existing job, embarking on a new career, or cultivating personal growth. Market demands and societal needs are repeatedly monitored and extensively reviewed. CLU brings together innovators and practitioners from industry, academia, non-governmental and governmental organizations, and associations to develop new curricula and improve existing programs, thus laying the foundation for relevant learning outcomes. This process ensures that graduates are equipped to meet the evolving challenges of today’s domestic and global societies with marketable and meaningful skills. Each Degree Program is designed with six learning outcomes that align with the University’s Mission Statement. Interpret religion in relation to structures of power and privilege and in the context of cultural, political, and economic histories. Construct and demonstrate an evolving literacy of major religious traditions and cultural identities. Appraise the function of religio-cultural identities and apply strategies to resolve moral-based conflicts in a way that is non-defensive, confident, and respectful. Research, collaborate, design, and implement high-impact strategies in a leadership action plan for social change. Analyze and interrogate normative and popular categories of religion while developing a post-secular awareness to interpret the evolving role of religious and secular traditions in the public sphere. Demonstrate the interpersonal and engagement skills necessary for effective leaders in a global community or organization. Apply awareness of self and the multi-faceted perspectives of others to lead in local and global contexts to reach common goals. Assess the cause of conflict in organizational settings and apply strategies to resolve and leverage conflict in diverse environments. Lead ethically and responsibly in positions of power in a workplace, community, or organization. Demonstrate the interpersonal and engagement skills necessary for effective leaders to achieve innovative and collaborative resolution to community and organization issues. Articulate and apply the major theories and principles of leadership, conduct analysis and recommend appropriate change strategies. Research, design, develop, and implement a capstone project plan to affect positive change in an organization. Apply resourcing strategies built on current market principles and procedures. Implement evaluation and learning approaches to gain visibility on and adapt efforts for systems change and social innovation. The CLU Assessment Team, consisting of experts in evaluation and instructional design, supports CLU’s institutional data driven decision model. Data reflecting course success are collected by measuring program learning outcomes. CLU’s Creative Assessment Continuum standardizes the assessment process. It is central to all aspects of the CLU organization, the foundation of which is a deeper comprehensive understanding of citizenship and success including individual student and societal benefits. CLU applies both indirect and direct assessment methods to evaluate student learning. 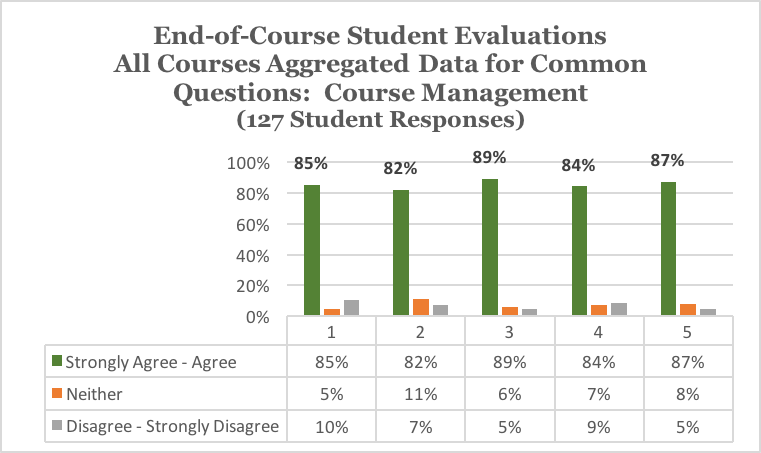 Faculty and CLU’s curriculum designer use the analyses of indirect and direct evidence to assess educational effectiveness; affirming success or providing direction for improvement. This course builds understanding of concepts and principles through explorations. This course emphasizes problem solving. Practical examples were used to relate concepts to professional practice in real life situations. This course includes a sufficient number of practical exercises. I have learned information / skills in this course that apply to my personal objectives this year. Instructional technology is well coordinated with course materials. The instructor was responsive to questions and concerns. The instructor helped to keep course participants engaged and participating in productive dialogue. My instructor gives appropriate / timely feedback on my performance. Course learning outcomes are developed for each course to support and align with the program learning outcomes. The five or six CLOs in each course are indirectly assessed as part of the end-of-course evaluation. Students respond to the statement “As result of this course, I am able to:” followed by each course learning outcome. Response options are: 5 – Strongly Agree, 4 – Agree, 3 – Neither, 2 – Disagree, and 1 – Strongly Disagree. Minimum and maximum averages of the CLO responses within each course are tabled below. 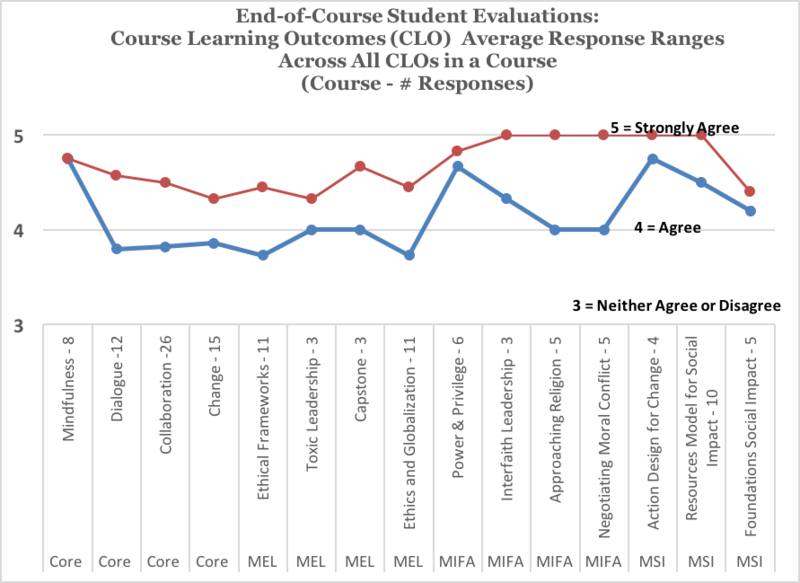 Across all courses, results indicate that students judged that CLOs were effectively taught (overall average ranges: 3.73 – 5.00). The direct method measures student performance as analyzed by the faculty using standardized rubrics, e.g. assignment grades including papers, discussion posts, portfolios, and projects. Assignments are designed to teach specific program learning outcomes. Thus, analyses of these measures are direct indications of the extent to which students have achieved program learning outcome, as well as an indication of the effectiveness of the assignments. MEL – MA in Ethical Leadership PLO2: Articulate the major theories in ethics, conduct analysis, and recommend ethical actions. MIFA – MA in Interfaith Action PLO3: Appraise the function of religio-cultural identities and apply strategies to resolve moral-based conflicts in a way that is non-defensive, confident, and respectful. MSI – MA in Social Impact PLO4: Research, analyze, and determine appropriate methods and contemporary strategies for designing and implementing initiatives that generate positive social impact. Throughout their programs, students’ work is captured in end-of-course portfolios, which are included as part of their final Capstone Action Projects. These portfolios can also serve as professional documentation through which students can feature their learning and share it with colleagues, employers, and in future academic studies. Program learning outcomes are identified within the portfolio and the direct assessments of the outcomes for MA in Ethical Leadership are presented below. Apply awareness of self and the multi-faceted perspectives of others locally and globally. Articulate the major theories in ethics, conduct analysis, and recommend ethical action. Articulate the major theories and principles of leadership, conduct analysis, and recommend behavioral change strategies. Assess the cause of conflict in organizational settings and develop and apply strategies to manage conflict in diverse environments. Research, design, develop, and implement a project plan to affect change in an organization.